Globe-trotting for humanitarian causes can be costly for a movie star. It stands to reason that you can’t attend to the exigencies of career ‒ the wheeling, dealing, the loathsome self-promoting ‒ if you’re busy making the planet a better place to live. This is Sean Penn’s quandary. His good works ‒ in Haiti and other hot spots — have cost him dearly in terms of box-office standing. Over the last four and half years he’s been MIA, doing mostly walk-ons in other people’s movies; when he did deign to star ‒ in “The Tree of Life” and “Gangster Squad” ‒ he seemed preoccupied, distant. And the public responded with equal indifference. Penn returns this week as a paid assassin who has lost his taste for international skullduggery in “The Gunman,” a John le Carré-esque espionage thriller. Directed by no less an expert in the field than Pierre Morel (“Taken”), it contains some decent shootouts and hand-to-hand combat ‒ in a hacienda, aquarium and bull ring ‒ but the writing mostly stinks, allowing for gaping narrative holes and more improvisational scenery-chewing by Javier Bardem as the guy who steals Penn’s girl, played by Italian actress Jasmine Trinca. Still, this movie stands apart in Penn’s filmography as his first balls-to-the-wall action picture, the kind of thing that once would have gone to Steven Seagal or Arnie Schwarzenegger. Penn, who also co-scripted and coproduced, expends a lot of energy and shows off a still-impressive physique. So he definitely looks the part. 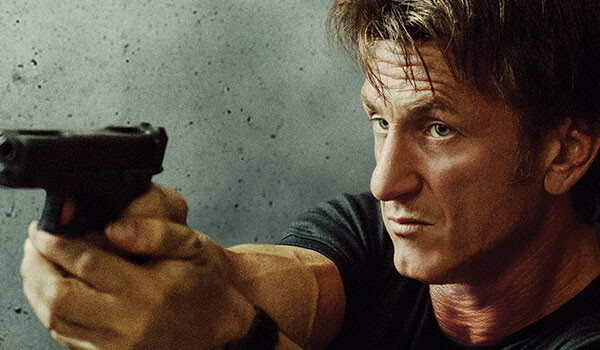 But unlike, say, Liam Neeson, who throws himself into “Run All Night,” Penn sleepwalks through this thriller; he’s less enigmatic than just plain bored. The message: I did this film to replenish the war chest; my first love is still political activism. Working from a novel by France’s Jean-Patrick Manchette, director Morel fields a not very bright private-security operative named Jim Terrier. The film opens in Kinshasa in the Congo, with triggerman Terrier being easily duped by his boss (Bardem). We peg this for a creep from the get-go because he’s always cloaked in shadow and panting after Trinca. It takes Terrier, oh, eight years to figure out he’s been played. And this is because his former employer, aka “The Company,” has a lucrative deal pending and sees the reformed Terrier, now doing penance by digging wells in Africa, as a liability. Film students will enjoy a reference to Sergei Eisenstein’s “Strike.” Here, Morel cuts between a dying bull and the battered Terrier. Too bad the metaphor is wasted on an ending that not only doesn’t ring true, but contradicts everything that has gone before.